Birds are not the most common pet, but they do add a more exotic feel to a household and can make great companions in the right household. Our blog has information and guides to help you decide if a pet bird a good fit for you. Birds often have a lifespan of at least 20 years depending on the species, and they each have their own personality. Most pet birds will form a special emotional bond with their owners. Many species of birds are highly intelligent, can speak, and keep up with the daily household routine. While birds need to be fed and watered like other pets, they do have some specific issues that need to be addressed. 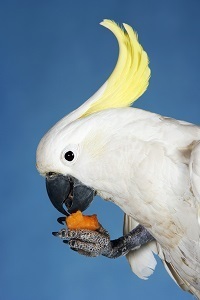 For example, owners need to have strategies for handling the bird when it gets fussy, screeching or imitating sirens. Also, their cages require daily cleaning to prevent germs and odor. As far as exercise goes, many bird owners recommend getting a pair of birds so they can keep each other active. Throughout this site, you will find complete guides for teaching your bird specific words, solutions for common bird behavior issues, and detailed instructions for keeping your bird happy and healthy.